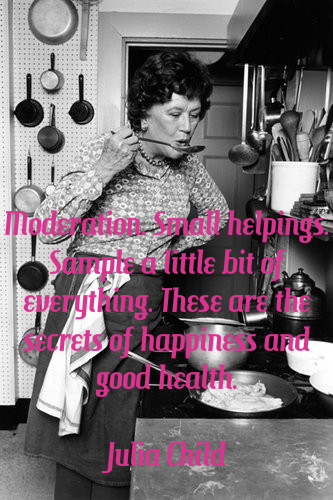 Julia Child Recipe For Happiness - True Story! 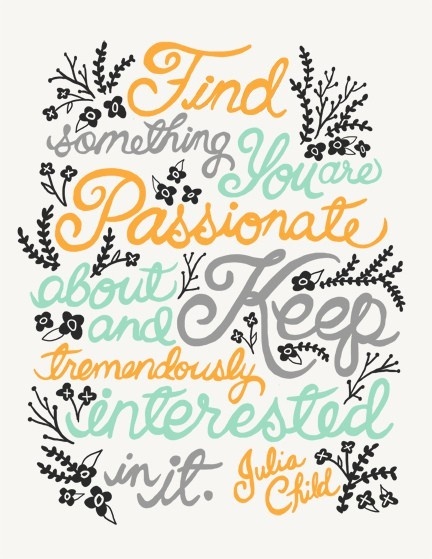 Master chef Julia Child steadfastly clung to some ideas. She didn't mind the microwave; it sometimes comes in handy. But try to cut corners with butter, and she wouldn't stand for it. "If you're afraid of butter, as many people are nowadays," she said in one of her last television shows, "just put in cream!" she proclaimed, with a twinkle in her eye. Julia Child worried that the "nutrition police" will kill gastronomy. "That's one of my favorite topics. The health fanatics and dozens of dietbook authors and obsessed nutritionists would have us believe we're all doomed by what we eat, and if these scareheads succeed in taking over, they're going to kill gastronomy." Child agrees with the revised upside down nutrition pyramid that advocates more fruit and vegetables and less fats and dairy products, but she favors moderation. "Nobody needs a fat 16-ounce steak," she said, "but when the nutrition police recommend steak no bigger than a pack of cards -well, I think that's silly. A lot of crazy things are being advocated by a lot of crazy, uninformed people, and what we really need is some sort of truth squad, a hot line that people could call to get really valid, official information about calories and fats and MSG and all that." Meanwhile, Child deplores all the junk food and prepared food Americans consume. But she occasionally gives in and has a Quarter Pounder with cheese at McDonald's. When asked the real secret to her success, happiness and longevity Child summed it up simply: "Beef and gin." My favorite thing I've read about Julia all day!